A sunny Snetterton welcomed us for the penultimate round of the 2017 Formula Ford championship. Classic Team Merlyn would be joined by a new driver, Arthur Atkinson who raced alongside Michael O’Brien who came into Snetterton leading the series. After a successful test on the Friday, both drivers came into qualifying knowing the car set up was dialled in and the quick times they’d done on the previous day. Michael would lead the majority of a short 12 minute session, eventually ending up in fourth after not being able to put together a clear lap without traffic at the end. Arthur repeated his solid Friday test performance and qualified the car in the midfield of a big 32 car grid. Race one got underway at midday with both drivers making solid starts and holding position, Michael was part of a break away lead group of four cars and had the lead of the race coming on to the last lap. 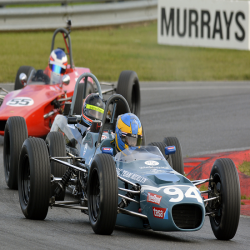 Due to the nature of the Snetterton 200 circuit and slipstream in the formula Ford, Michael would fall to third after being overtaken by two cars down the straight. Race two was setting up be another great battle, having consistently been improving over the course of the day, Arthur suffered an unfortunate spin in the second race, dropping him down the order and eventually leaving him to have a lonely race. Michael was again in contention for the race win, this time actually leading the race out of the final corner, unfortunately, this still wouldn’t be enough as the second place man slipstreamed past and piped him to the line by 0.001 of a second. With good fun had and strong points scored, the team are in a strong position for the final round at Silverstone next month, With Michael firmly in contention for the 2017 crown.